Its shares were then suspended before Tuesday's trading, at its own request. On Monday, it rejected a £150m offer from Mike Ashley's company. Laith Khalaf, senior analyst at Hargreaves Lansdown, said that Tuesday was set to "mark the endgame for control of the department store" and that the rejection of Sports Direct's overnight bid "suggests that Debenhams simply isn't interested in what Sports Direct has to offer". 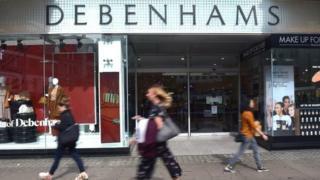 He added: "It looks like Mike Ashley has one final card to play, and that's making a firm takeover offer for Debenhams. Even that seems unlikely to shift the retailer from the course it's currently on, as it sounds like the department store is preparing to enter administration imminently."